The beachfront Two Chefs restaurant now offers a wide selection of Thai and Western culinary specialties, including soups, salads, pastas, seafood, traditional Thai food, Mexican food as well as Two Chefs Trademark Grill and Steak dishes and a choice of delicious deserts. Open for breakfast lunch and dinner, the Two Chefs Beach Bar & Restaurant within Serenity Phuket also offers a selection of amazing cocktail creations that the experienced bar team have created to compliment the new menu. 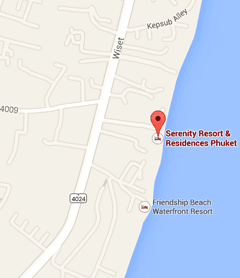 Visit Serenity Resort and Residences, just south of Chalong Circle in Rawai Phuket, and enjoy our marvelous beachfront location and the new culinary creations on offer. Chill by the pool and enjoy our truly refreshing and serene atmosphere.